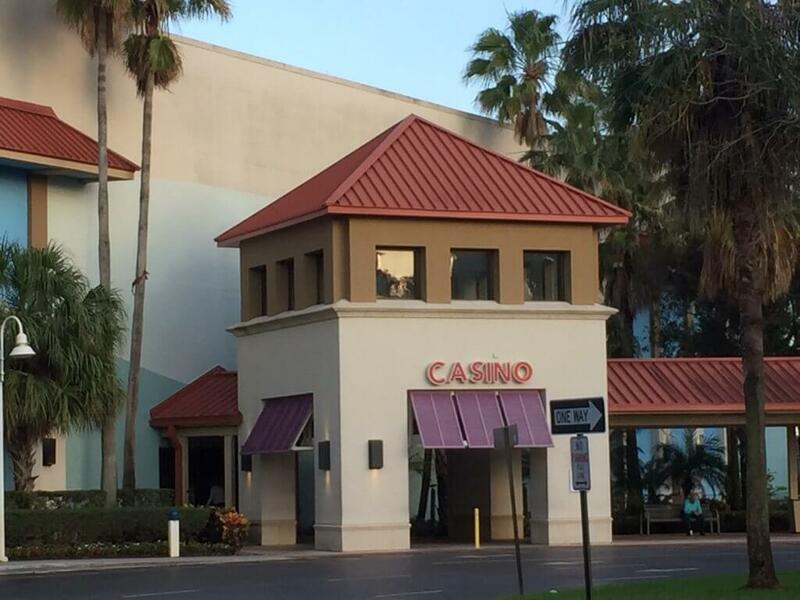 The Isle Casino Pompano Park poker room is a key part of the busy South Florida poker scene. With 38 tables and a fairly active cash and tournament poker scene, Pompano forms a big three with Seminole Coconut Creek and Seminole Hard Rock Hollywood. Seminole Coconut Creek is the closest competitor to Pompano Park, lying about 6 miles to the northwest. There are also a slew of other smaller rooms around Miami. Pompano Park certainly has natural advantages, being only a few miles inland from the Atlantic coastline and near Ft. Lauderdale. However, as it is further from Miami than many rooms and in a very competitive poker scene, Pompano faces a challenge in distinguishing itself. The Isle Casino Pompano Park poker room is about 20 minutes north of the Ft. Lauderdale Hollywood airport. It sits about five miles inland from the Pompano Beach coastal area. Pompano Park is off of Route 845, just south of where it intersects with Route 814. Route 814 East toward to the coast will take you to downtown Pompano Beach and its restaurant row. For golf aficionados, Pompano Park is directly across from the Palm Aire Country Club. This area, like most of South Florida, is pretty congested, so if you’re heading in for a tournament, leave yourself plenty of time. The parking lots are huge, so you should have no problem finding parking on a typical day. The building itself is large but fairly manageable as casinos go. Isle Casino Pompano Park doesn’t have its own hotel. Their website does provide some links to some local partner hotels, however. There are plenty of slots and electronic table games downstairs, but no live dealer table games. Apparently, only Florida casinos on Native American reservations (e.g., Seminole Hard Rock, Seminole Coconut Creek) are allowed to have live table games. The gaming area is nicely laid out, although somewhat dark. A harness racing park is attached to the casino and horses were running the day that we visited. There is also a large and active simulcast area upstairs behind the poker room. Pompano Park has four main dining options: a steakhouse, a deli, a farm-to-table buffet, and a fast food spot. All four looked pretty appealing when we strolled around and poked our heads in. The 38 table Pompano Park poker room is upstairs next to the simulcast area. 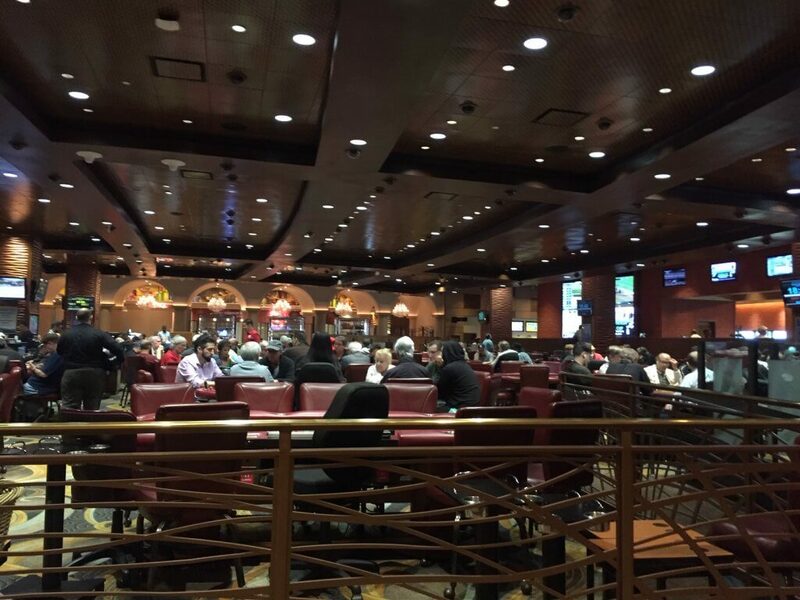 The poker room is a large open space with plenty of room between tables. Despite being open to the casino, the air was clean and not smoky. The openness did make it hard to hear at times. The temperature in the room was very comfortable. Maybe it was an optical illusion, but the tables seemed huge. Chairs were not adjustable, but were on wheels, and very comfortable. The pristine felts were in stark contrast to the room’s ancient, worn chips. Some denominations were hard to distinguish, given the wear. Someone at my table made a joke (I hope) about these being the same chips Pompano has used for the last 12 years. The room was dim, which made distinguishing chips a further challenge. The staff was not Pompano Park’s strength, if our visit is any indication. The woman in the cage who signed us up for the tournament entered us (and several others) into the wrong tournament. Once the floor had straightened the problem out my seat had been sold to three different players. The tournament clock was also started with only three players signed up, but the dealer was not allowed to deal until the fourth and fifth players arrived. It seemed like an odd decision on the part of the floor (more to come on the floor). Suffice it to say, the start of the tournament was a bit of a mess. The dealers were generally strong – fast and skilled. There were shufflers in the tables which helped the pace of the game as well. The floor, however, made some odd decisions that really troubled us. One player, clearly a regular, was repeatedly testing the limits of speech play, seemingly to rile other players. Among his violations: 1) telling the player to his right he would check behind if the player checked (and then betting); 2) trying to make a deal with a player two to his right to go all in blind when it was their button/big blind; 3) and talking about his hand during action repeatedly, including implying what exact hand he held. Players complained to the dealers who did nothing. Finally, the floor was called. Those at the table described some of the above violations and asked whether these were allowed. The floor skirted the issue and just kept saying “We prefer he not” to each example. It became somewhat of a comedy routine, as players would present a scenario, which in any other room would be a clear violation, and the floor would say “We prefer he not.” It quickly became clear that there were few enforceable rules at Pompano Park. Unsurprisingly, this situation did not create the best environment at the table. From our limited experience, it was a bit hard to get a read on the typical player at Isle Casino Pompano Park poker room. Most we encountered were regulars who knew one another. There were clearly some longstanding rivalries at the table. Players ranged from solid to very loose aggressive, with not a lot of weak spots. Again, we were at a somewhat contentious table, but even there, several players were very friendly and reasonable. 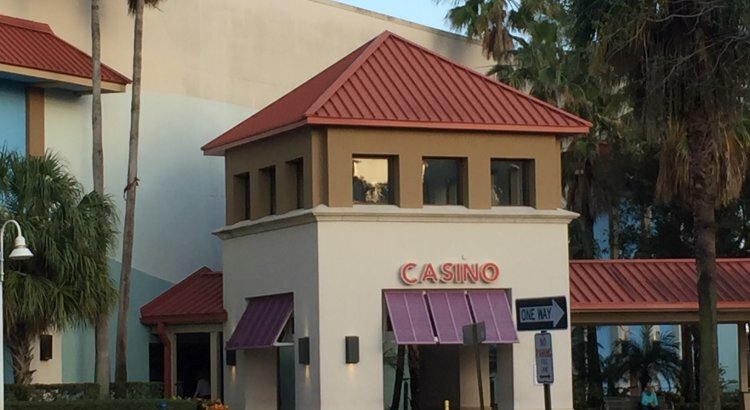 The Isle Casino Pompano Park poker room contends strongly in the busy South Florida tournament poker scene. They typically offer two daily tournaments, one starting in the late morning and the other in the early evening. Most have a traditional NLH rebuy tournament structure, with 20 minute blinds, paying out the top 10%. The room mixes in a couple of weekly Survivor tournaments, a bounty tournament, and an Omaha event each week. A couple of the games also have add-on options. Although weekday tournaments see modest turn-outs of 20 to 50 players, Friday night things pick up (with 60+ players on the typical Friday evening tourney). Most of the Saturday and Sunday night tournaments that we tracked on Bravo Poker exceed 100 players. Check their tournament calendar before you go, because they also run special series with larger buy-in events. Rakes seem to be around 25% for most of their daily tournaments. That may not seem great, but compared to what we saw at other South Florida rooms (some of which were 30%+), this was not bad. The Pompano Park poker room competes well for the $1/$2 and $2/$5 NLH player in South Florida. On weeknights, they get between 5 and 7 $1/$2 tables and 2 to 4 $2/$5 tables, with a smattering of other games. On Saturdays, there are typically 6-7 tables of $1/$2 in the early afternoon, rising to 8 to 12 in the evening. The $2/$5 tables stay around 4 to 5 throughout the weekend. Several cash tables were active the Thursday evening that we were there. The Isle Casino Pompano Park is a moderately sized casino with several good dining choices and plenty of other entertainment options. The poker room itself offers a nice open second floor setting. We were very optimistic when we arrived and saw the set-up. However, our experience playing in a tournament made us concerned that Pompano Park may not have the personnel to fully realize its potential. In the end, the experience left us pretty disappointed. Our hope is that the room is better than what we experienced on our visit. The room’s typical cash and tournament volume would indicate that others are having a better poker experience. Players would not keep coming in these numbers, with the many other options around, if the room was not well run. If we return to South Florida, we’ll check it out again and perhaps have a better experience.